Refashion Co-op: Does This Skirt Make Me Look Like Mrs. Claus? 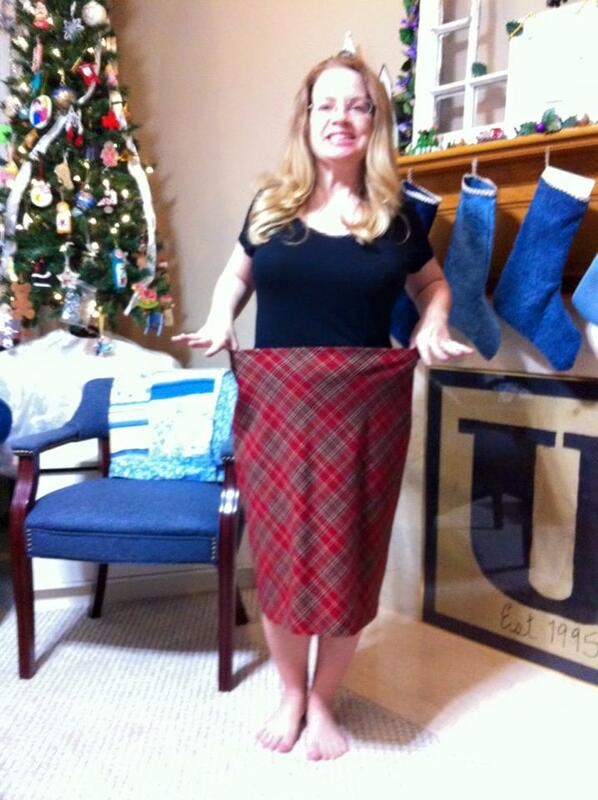 Does This Skirt Make Me Look Like Mrs. Claus? Hello Refashion Co-op. This project kind of stumped me. 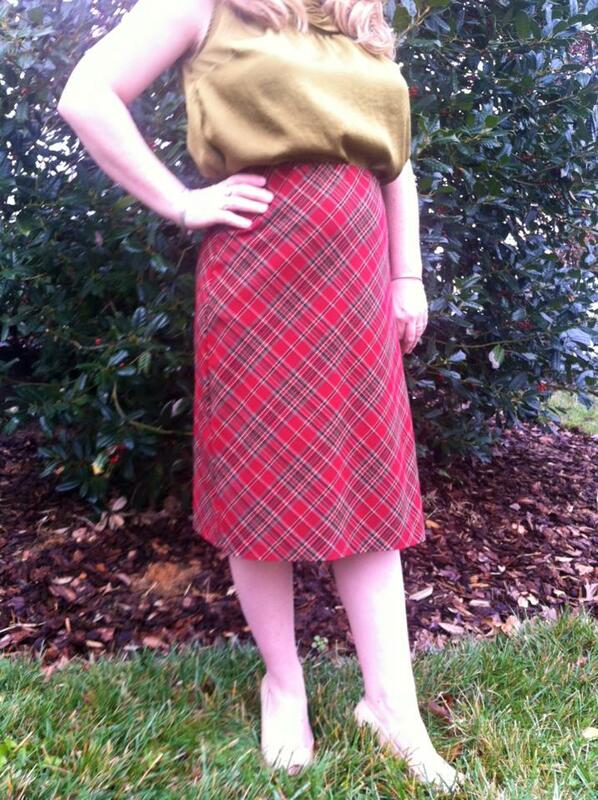 This red plaid skirt screamed Christmas to me. I have been saving it to wear on Christmas Eve. It was too big and made me look like a frumpy Mrs. Claus. I didn't like that. I thought I would just shorten it and leave it as full as possible. It would be more fun. But that might look like a school uniform. That wasn't what I wanted either. I narrowed the whole thing. I didn't want it too tight but it needed to be more fitted. I decided to leave it the length it was. Any thoughts refashion friends? I usually have a set plan, but this time I was unsure what to do. It has gotten very warm where I live. It will be a very warm Christmas. It's like Spring, flowers are blooming because they are confused. Thanks for reading, now go make yourself something fabulous. It does look nice, but I am wondering whether just a bit shorter might be a better proportion for you. Definitely perfect for Christmas Eve! 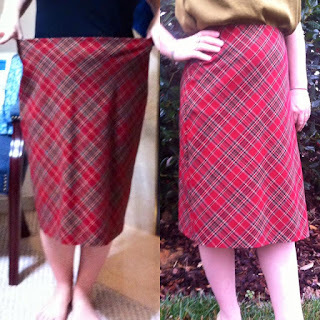 I have the same skirt with the same problem a few years ago. I basically just shortened mine so I could pair it with my boots. I agree with KD to shorten it an inch or two. 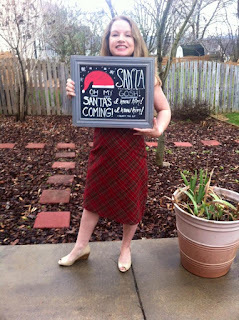 You won't look like Mrs Claus as long as you pair it with the right stuff. I thought that too. I was afraid of the Catholic Schhol Girl look. But a little shorter is probably better than below the knee. Thanks. That is a good point. I usually wear boots in the winter. Thanks. I think now that it's more fitted, the shorter length will not be at all uniform-like, and will be a good length for you. 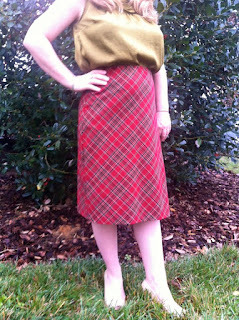 I've never thought of wearing red in a skirt instead of a top. Red looks bad on me next to my face, but a skirt would be far away from my face. Must remember for next year! Thanks. Red isn't my best color either, but I love it so. Glad you liked the idea.